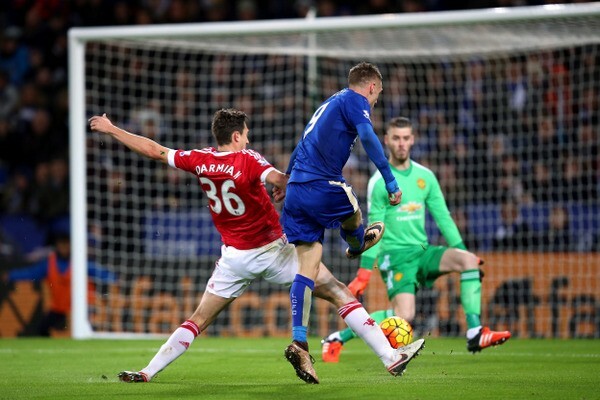 Jamie Vardy became the first man in Premier League history to score in 11 consecutive matches after opening the scoring for Leicester City in their 1-1 draw with Manchester United in Saturday's late kick-off. The 28-year-old, who just four years ago was playing for Fleetwood Town in the Conference, scored his 14th goal of the season midway through the first half, a goal that broke Ruud van Nistelrooy's previous record of scoring in 10 consecutive Premier League matches set in 2003. Vardy is now available to back at just [3.5] to be the league's Top Goalscorer this season having previously been matched at the Betfair Exchange's ceiling price of [1000.0]. The Foxes were unable to hold on to their lead however, Bastian Schweinsteiger heading United level on the stroke of half time. The result keeps Leicester level on points at the top of the table, though Claudio Ranieri's men are still considered as rank outsiders to win the title, available to back at [80.0] after Sunday's games. United can be backed at [6.0]. Manchester City remain the [2.0] favourites after they comfortably beat Southampton 3-1 at the Etihad Stadium thanks to goals from Kevin de Bruyne, Fabian Delph, and Aleksandar Kolarov. Sergio Aguero limped off midway through the second half, raising more concerns about his fitness. The Man City striker can be backed at [4.5] to top this season's goalscoring charts. Man City and Leicester could have been joined at the top of the table on 29 points by Arsenal but the Gunners could manage only a 1-1 draw with Norwich at Carrow Road on Sunday afternoon. Arsene Wenger's men are [4.8] second favourites to win the title. Tottenham remain fifth in the table after drawing 0-0 with Chelsea at White Hart Lane, a match that will probably receive more headlines for Diego Costa's absence than what happened on the field after rumours emerged of a bust-up between the Spanish striker and boss Jose Mourinho. Spurs are available to back at [2.3] to claim a Top 4 Finish, Chelsea can be backed at [5.4]. Liverpool, who beat Swansea 1-0 at Anfield, are available to back at [1.98] in the same market. Aston Villa remain firmly rooted to the bottom of the table after losing 2-3 at home to Watford on Saturday afternoon, a result that leaves Remi Garde's men seven points from safety. They were joined in the bottom three by Newcastle who were thrashed 5-1 at Crystal Palace, while Bournemouth occupy the third relegation slot despite scoring a 98th minute equaliser in a scintillating 3-3 draw with Everton. Sunderland were the big winners over the weekend in the bottom regions of the table after they beat Stoke 2-0 at the Stadium Of Light, the Black Cats' second league victory in the space of five days.